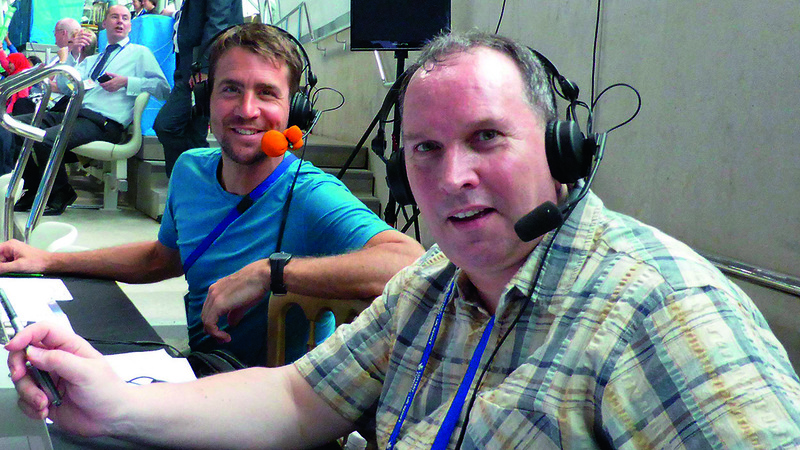 Commentator Bob Ballard has been to the Olympics, World Championships and covered swimming, diving and water polo during an illustrious broadcasting career. Here he looks back on his career behind the mic. How did you get involved in broadcasting and what was the first aquatic event you covered and for who? I started in professional broadcasting in 1983. I worked in the music industry after leaving school but my ambition was to get into broadcasting. I was doing Hospital Radio in Hillingdon from when I was 16. But my big break came at BBC Radio Medway, which became Radio Kent soon afterwards, presenting their Saturday afternoon sport and music show ‘Out and About.’ I was on that programme and did the station’s ‘Drivetime’ Show for about four years. I then went to BBC Radio York for a year and also worked at BBC GLR and the local radio sports unit in London. The first aquatic event I covered was the European Championships, in Sheffield, in 1993. I was working at BBC Radio Sheffield and was deployed to cover the competition. I was immediately hooked on the sport and, as importantly, the people within it, which stoked my love of it and wanting to be around it long term. Tell us about your swimming background? How old were you when you learned to swim and did you ever compete? No real swimming background. I swam at school, the old Ealing baths at the back of the Town Hall. I learned to swim on holiday, I think, when I was nine or 10 and got more proficient when I got to Grammar School and was doing it every Friday morning. What aquatic event do you enjoy covering the most and why? I’ve said it in commentary a few times, I think, but the 4x200m Freestyle relay is my favourite event – because of the way it can, and often does, change complexion over seven minutes or so. The medley relay also falls into that category but the 4x200m Freestyle always just edges it for me. Pure drama and theatre. Do you believe swimming gets the coverage it deserves in the national media (TV, radio, press)? No, far from it. I have always struggled to work out why athletics gets, to my mind, a disproportionate amount of coverage. During the years when track and field was more successful in this country, maybe. But that equation has changed a lot since London 2012 and still small athletics events will get huge coverage on ‘terrestrial’ TV while swimming has to hope for red button coverage, at best, on many occasions. We have the personalities in the sport but a snatched chat with Sharron Davies after a race is not the best way to showcase them. Same goes for diving too. Which major aquatic championships you have covered will live long in the memory and why? Perversely, the Olympic Games in which GB did the worst, Sydney 2000, is the one that I look back on with the most fondness. We had Tracey Wickham on the BBC Radio team and she was such a laugh and we had a fantastic eight days – admittedly talking mainly about the exploits of others – but it was so well staged. London comes a close second but mainly for the Paralympic exploits of our swimmers. The diving in London also achieved the highest viewing figures BBC3 ever got so that’s a proud thing to be associated with. What is your most amusing story from your broadcasting career? Trying to interview Gregor Tait at a European Championships in Budapest just as the most-almighty storm hit. We had to abandon it just as we were starting as a monsoon fell on the ‘mixed zone’ and the day’s programme had to be abandoned. I was the epitome of a drowned rat. There was more water outside the pool than in it after about half an hour. And we thought the electrics were going to fry us all alive for a while. And what is your most embarrassing moment while commentating at an event? Others see this incident differently to me but it’s got to be the ‘infamous’ live interview with Bill Sweetenham on BBC2. Off the back of a poor Olympics in Athens, considering expectations, we only picked up three bronze medals at the 2005 World Championships, in Montreal, with, admittedly, a small squad. Bill wouldn’t speak to Sharron Davies so BBC TV asked me if I would do the chat, as Bill was happy to talk to me. So, after commentating on the 1500m Freestyle for BBC Radio, in which David Davies had won one of those three bronze medals, I duly went to the interview position and spent a few awkward minutes on live TV being lambasted by the national performance director, who accused me of being the most negative journalist. That came as a surprise to the swimmers, who had always considered me very sympathetic and objective. It was used on Breakfast News, both BBC and ITV the next morning, and I’ve never been allowed to forget it by the coaches who were around in 2005. What events will you be covering in the future? I’m hoping to be covering domestic swimming meets and diving competitions in 2019 and some of the Diving World Series events too. And maybe some more Water Polo – I covered the World Cup for FINA TV this year. What advice would you give to anyone considering a career in broadcasting? Work out what you want to do and what the end goal is. People say to me ‘I want to get into broadcasting’ without ever really knowing what it is they want to do. There are so many facets to it now, not just radio and TV but podcasts, streaming, all kinds of things that weren’t around when I started in the business 35 years ago. Also, don’t try to copy others. Be inspired by them, guided by them, sure, but don’t ape the commentators or reporters you admire. Be yourself! I do watch sport for fun, too, though as a West Ham season ticket holder and Middlesex CCC member, I’m not sure how much fun I have had following those two clubs this year. I’m also a big music fan, across a wide range of genres. I’ve found myself going to more gigs in recent years and my taste is getting heavier as I get older! Winning a Sony Award, the radio equivalent of a BAFTA, for a special Euro ’96 Breakfast Show I did for BBC Radio Sheffield. We had lots of problems during the course of the show but the listener wouldn’t have known, and to get praise from the radio industry for it was something special. If I could have a sport-filled day incorporating some of my favourite sports and round it off with a good music gig and a couple of beers, that would be virtual perfection. Which swimmer would you most like to swim against and why? I wouldn’t. My swimming days are long behind me. I’m happier watching and admiring real skill, rather than my thrashing attempts these days. This article first appeared in the November-December edition of Swimming Times.